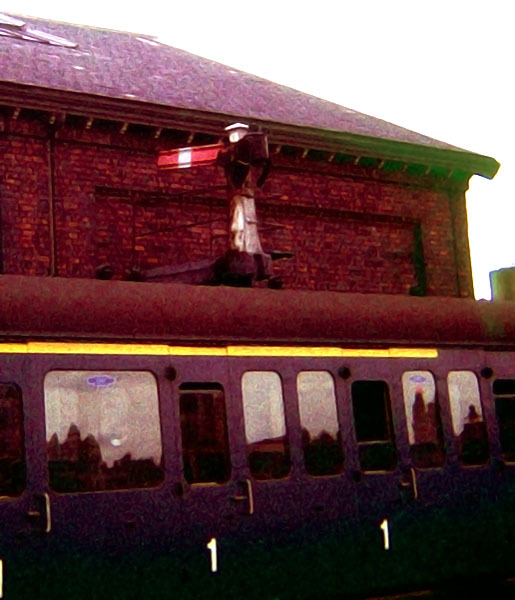 I first cut my signal photography teeth around the West Midlands in my early teens. My very first camera was a Kodak Instamatic, though I bought a Cosmic 35 (35mm compact) a bit later and subsequently progressed to Zenith B and then Practica MTL3 SLRs. Starting in 1970, my parents let me have 7-day Midland Railtourer tickets, which covered the whole of the Midlands, each year during the summer holidays, and off I went. I used slide film to save money, and thus started what was to grow over the years to a collection of some 2,000 railway slides. 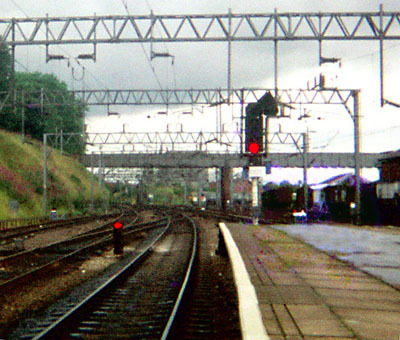 So here are some of the highlights of my early rail photography days. Often I only took one or two shots at each place, so I've created this page for photos taken at places where I don't have enough shots to warrant creating separate pages. I have now moved the Kidderminster section to a page of its own. 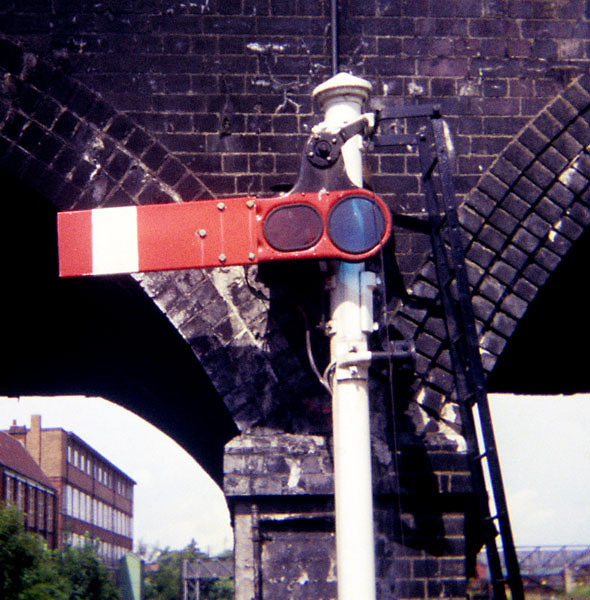 This crossbar signal survived into the 1970s at the Cadburys' goods yard in Bournville. The ground frame and a couple of the shunting locos. On my next visit I discovered the above signal had been replaced by this BR(LMR) upper quadrant ... complete with GWR-style finial! Unusual to see four ground discs mounted vertically together. The top two were clearly recent additions. The down starting signal for the Stourbridge Town bay. Unusual to find a GWR/WR signal with a goods arm directly beneath a main arm, and note the shared "cash register" route indicator. This unusual bracket with shortened arms used to control the entry to the down main and platform lines at Wellington. 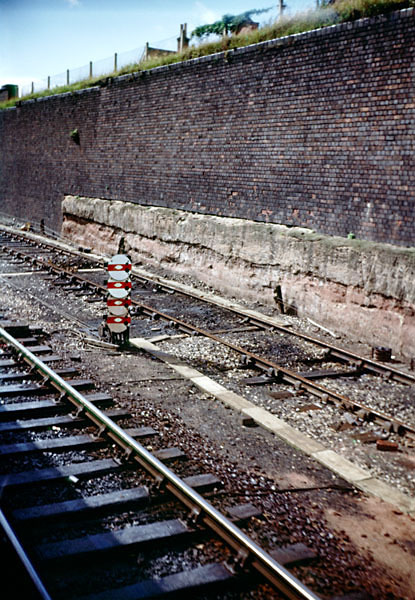 This co-acting signal, with the lower arm bracketed slightly to the right to get round the limited clearance alongside the retaining wall, used to be the down starter at Sutton Coldfield. 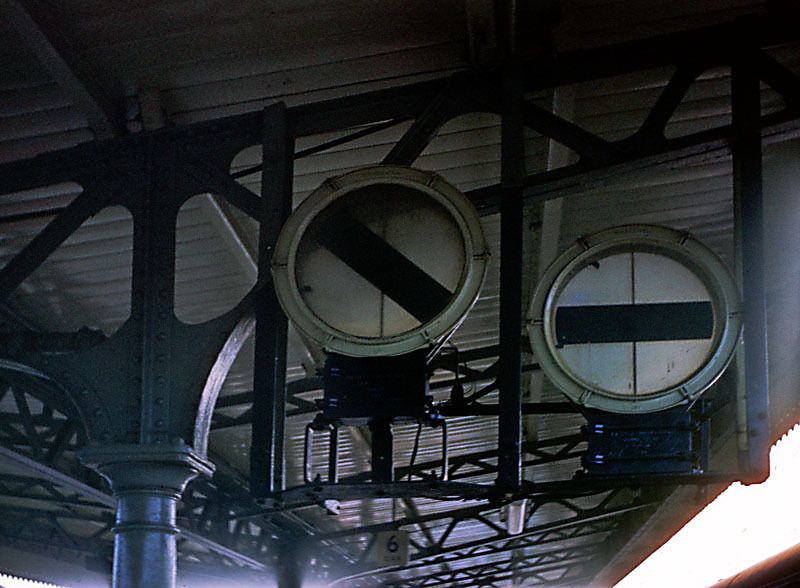 A closer shot of the signal, taken from under the footbridge. 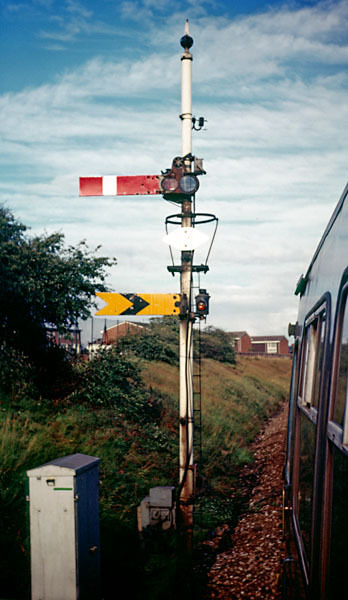 This yellow-armed goods signal was presumably equivalent to a yellow disc, reading to the main running line but with movements onto the headshunt able to pass it when on. 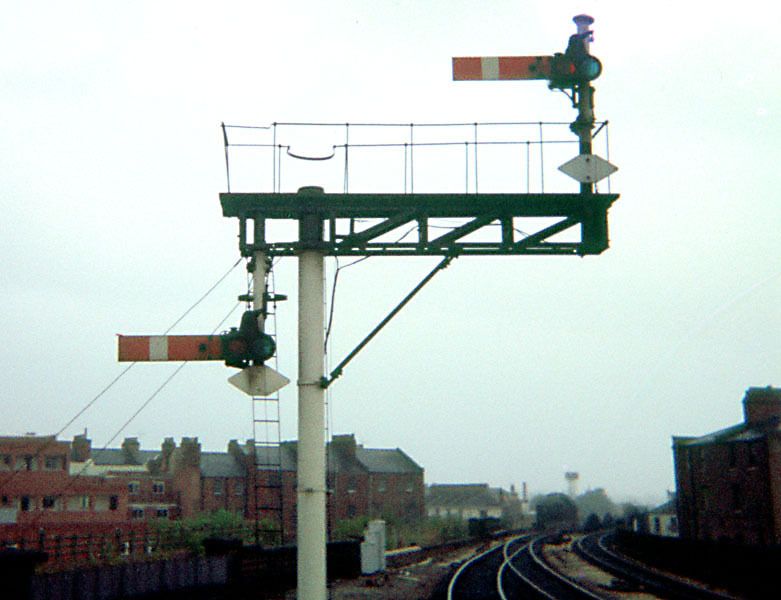 A co-acting home signal at Four Oaks. 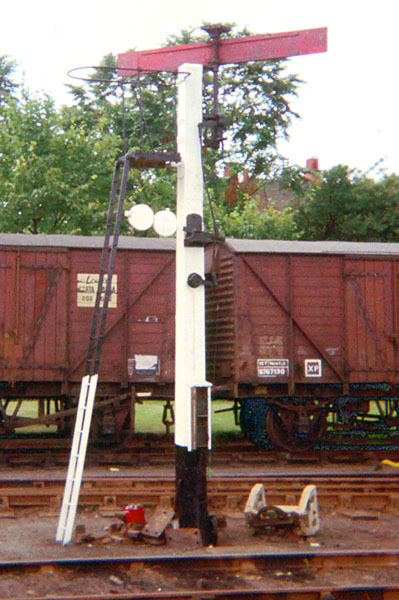 The semaphore down starter with Saltley panel's colour-light repeater beneath. A pair of splitting banner repeaters on the down platform for the junction with the Kenilworth line. The view through the station towards Cheltenham. 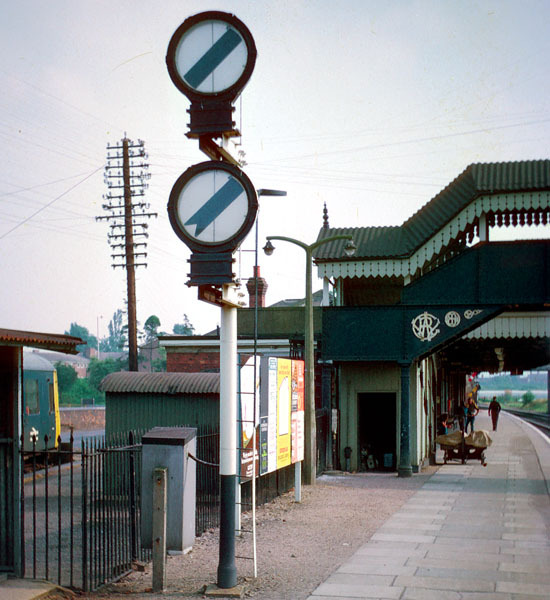 When the line to Cheltenham was still open, this stop-and-distant banner repeater on the down platform repeated Stratford-upon-Avon's advanced starter and Evesham Road Crossing's lower-arm inner distant. 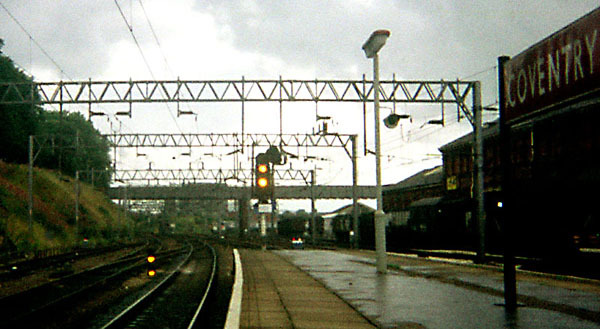 The actual signals can be glimpsed at the far end of the platform, as a frieght train is signalled through. Note also the GWR monograms on the footbridge. A closer view of the repeaters. 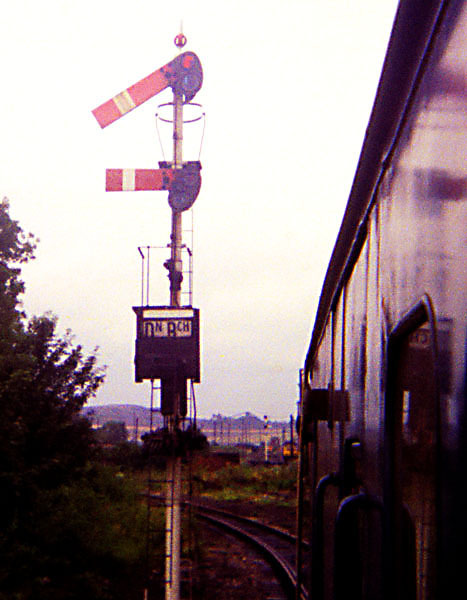 Until the West Coast Route Modernisation, this was the junction signal on the approach to Nuneaton from the Birmingham line. Five "feathers", a position-light subsidiary with an illuminating 'C' indication, and three stencils! 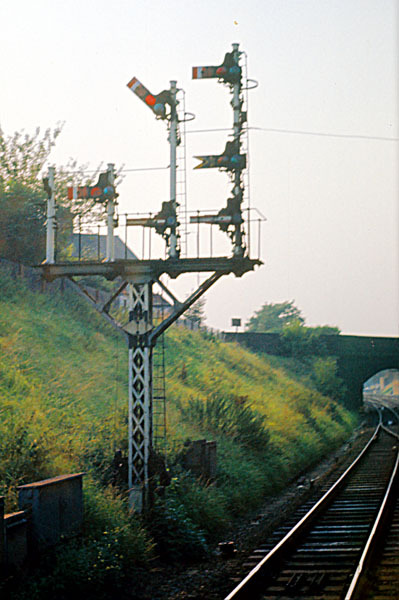 A revolving disc shunting signal. 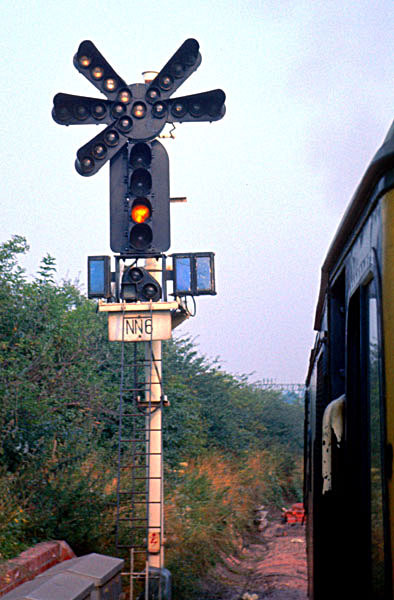 A 4-aspect signal showing a call-on route to the rightmost diverging line. Note the obsolete illuminated 'C' indication. 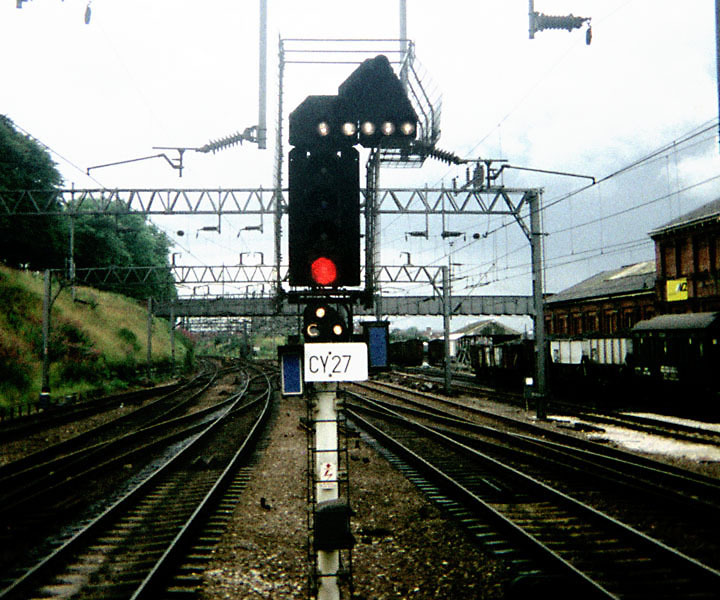 A wider view of the above signal reveals that it has a second, co-acting head at ground level on the left, for sighting purposes. The red aspect on the co-acting head is placed at the top as the policy is to always have the red lamp closest to the drivers' eye level. 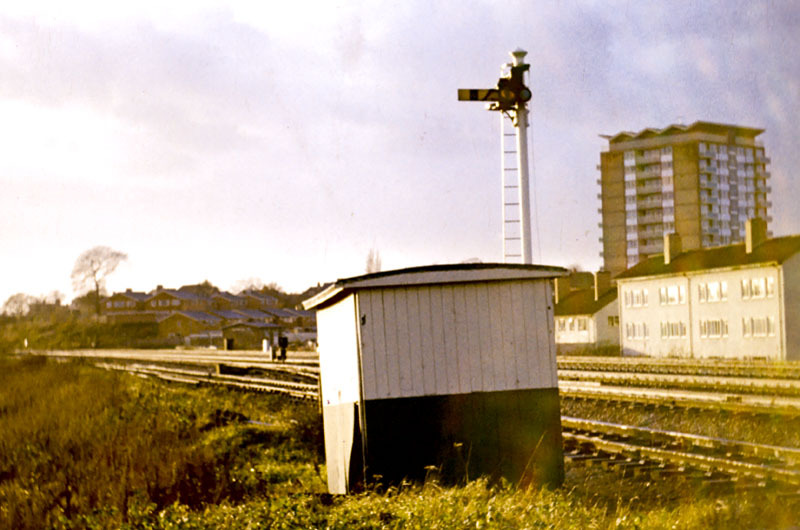 This was the up home (platform starting) signal at Redditch, when it still had a signalbox and the station was still south of Windsor St. Note the shortened arm for clearance purposes. 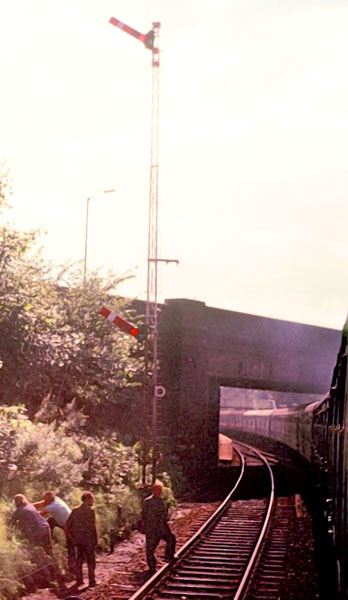 The up advanced starter, with Smethwick Junction's fixed distant beneath. The odd appearance is the result of the LMR having replaced the original lower-quadrant starter arm with an upper-quadrant, after the line had previously been transferred from the WR. 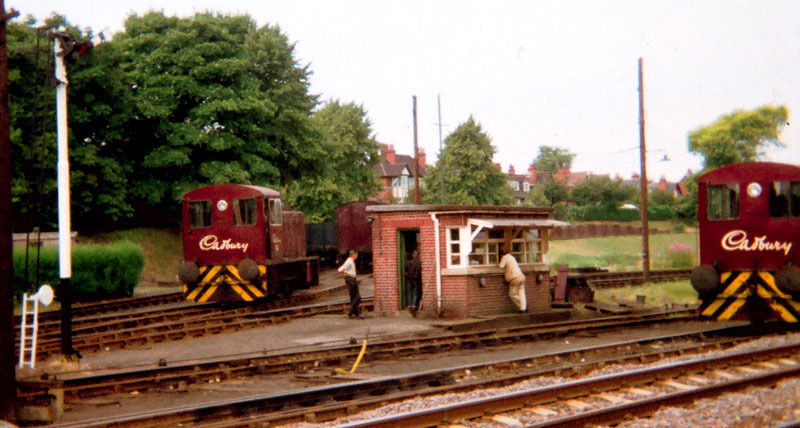 This may have been done the previous year when Oldbury & Langley Green East box was closed, with Middle box taking over this signal, and hence the provision of the motor at the bottom of the post. After Birmingham Snow Hill closed in the 1970s, a set of mosaics were put up around the pedestrianised inside of a nearby roundabout as a tribute to the GWR. Their accuracy is impressive - look how well the centre-pivot signal has been portrayed! 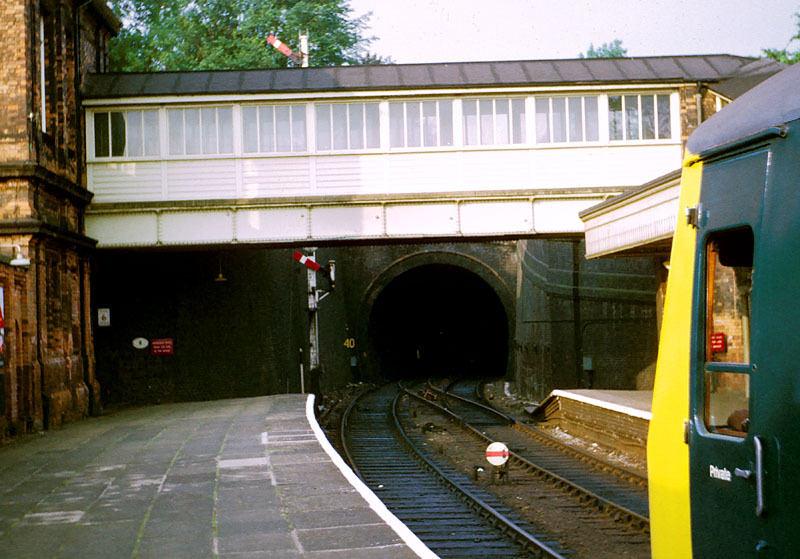 Ironically, the line through the tunnel to Moor Street was closed a few years earlier than Snow Hill itself, with the latter surviving a while longer as a terminus for commuter trains from Wolverhampton and Langley Green, to the west. 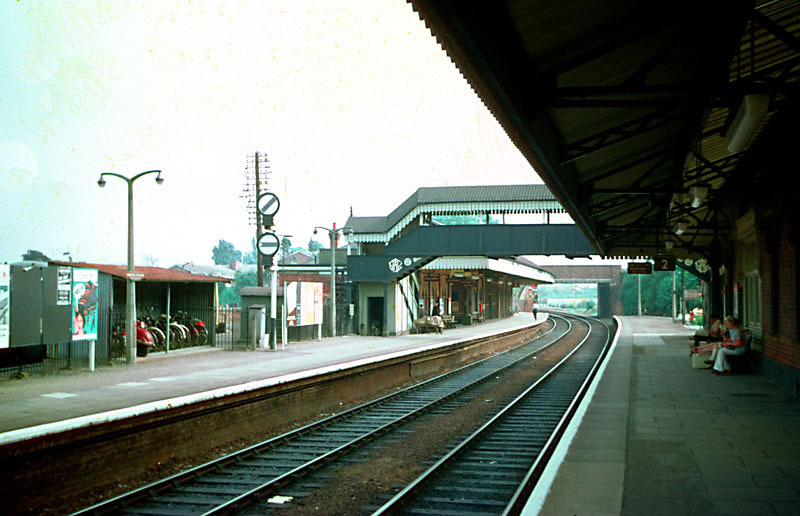 But when it was reopened, it initially served as a terminus for trains through the tunnel from Leamington and Stratford-upon-Avon, to the east, with the link to the Stoubridge line only re-opening later. Snow Hill therefore boasts the unusual claim of having been, at different times, a terminus for trains departing in opposite directions!